Last week my little family headed down to SoCal to visit my husband's family. 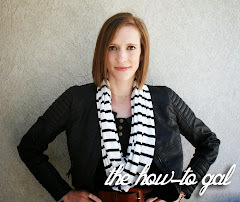 We headed to Disneyland, soaked up the sun and visited my new favorite place: the L.A. Fabric District. It's located in downtown L.A. in the Fashion District-four blocks from 8th Street down to Olympic Boulevard. Fabric lining the streets. Baskets filled with fantastic prints, linens, silks and more. Yes, that top right image is advertising fabric for $0.50 a yard! I had a blast just wandering through the shops looking at all of the fantastic fabric. I had two favorite places: L.A. Alex Inc and the Michael Levine Loft. 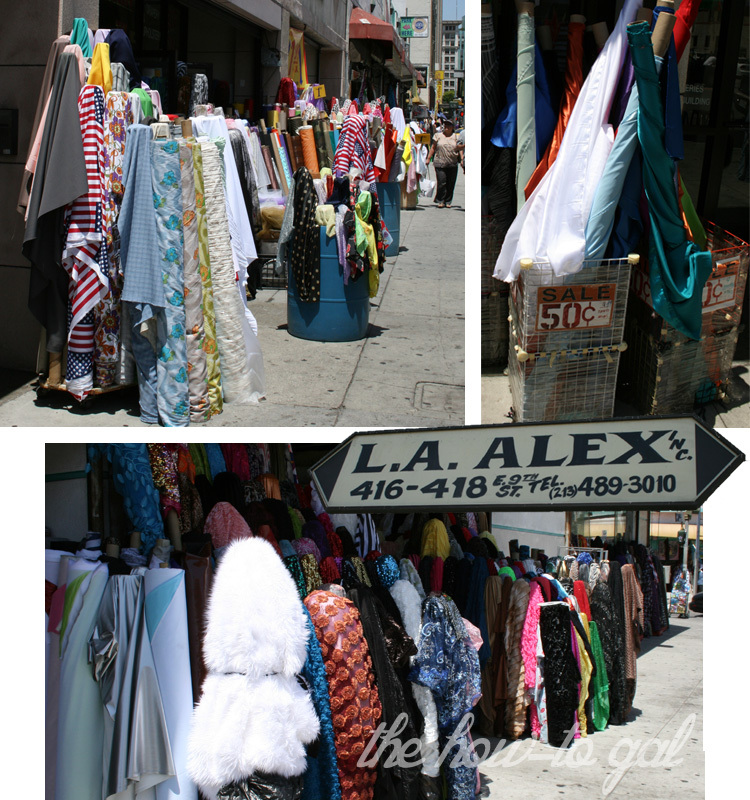 L.A. Alex Inc. had tons of solid textiles, notions and hardware for rock bottom prices. 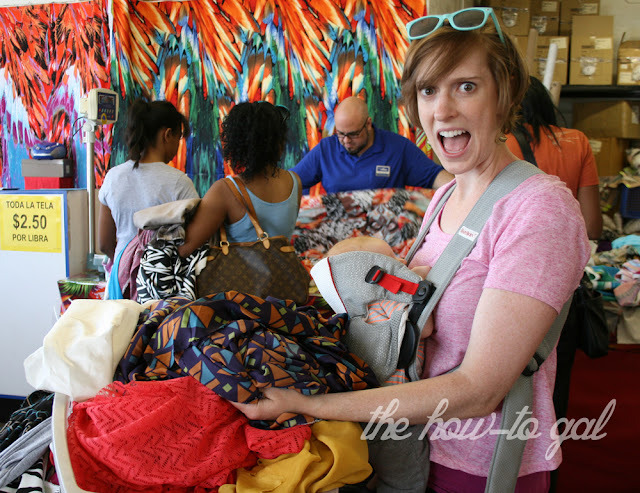 We headed to the Loft first and then hit L.A. Alex's for lining fabric and zippers. 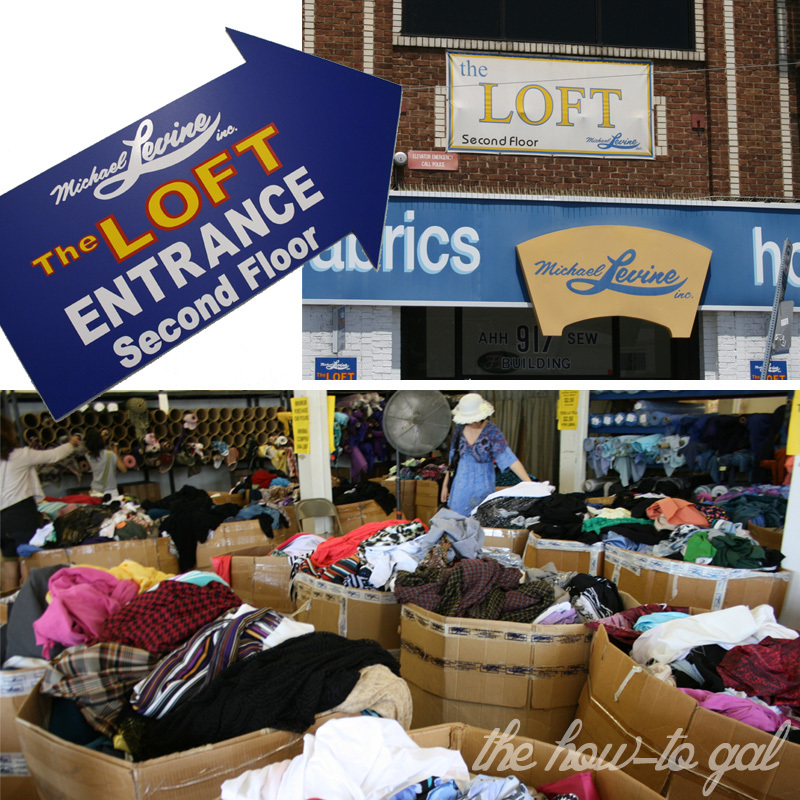 The Michael Levine Loft is a treasure trove of remnant fabric from the retail store across the street. In these giant cardboard boxes you'll find yardage of designer fabric for $2.50 per pound. For someone like me, the type of person who loves to hunt for deals, this place was heaven. I couldn't believe all of the prints I found...nothing like what you can find in Utah. Baby W joined me and happily slept the entire time. All of this fabric and three zippers for a whopping $26. I can't wait to start creating! If you follow me on Pinterest, I'm building a board with inspirational images to help me decide what to do with all of this fabric! Parking is crucial. We initially parked on the street at a meter and had to run back after an hour to feed it. Maybe this works for other people, but an hour goes by FAST and we didn't want to worry about running back every hour. We chose to park in the lot right behind the Michael Levine retail store. It was a $6 flat fee for the entire day and the guy parked our car for us- no need to worry about getting in or out of the tiny spots. We liked this option because we could peruse the shops, not worry about getting a ticket and head back with purchases if we needed to. Go to the Michael Levine Loft first. 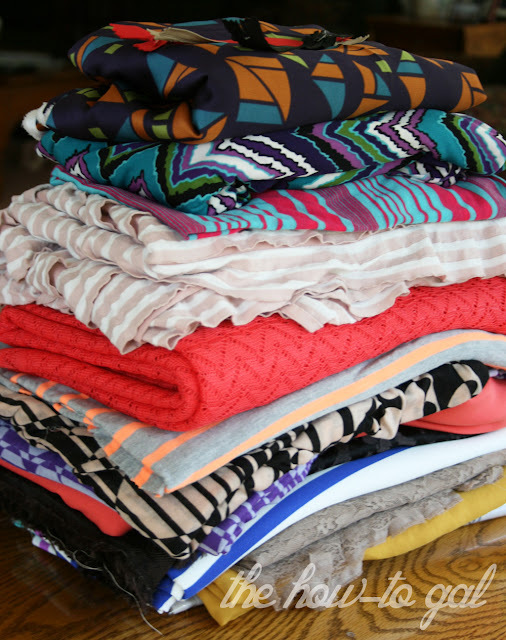 Once you've got a stack of fabulous prints and knits you can head to the other tiny shops or, my favorite L.A. Alex Inc., to purchase lining, notions, etc. If this is your first visit, give yourself time to look around! You don't want to be rushing...there is too much fun stuff to look at! Shop around. Many of the shops have the same stuff with different prices. I was looking for clear vinyl and one shop had it for $5/yard while another had it for $1.50/yard. You can always go back if you can't find a better deal. Haggle. Think the price is too high? Offer what you're willing to pay. Most likely they will counter-offer or accept your offer. Either way, you're getting a better deal. Never hurts to ask. Have you ever been to the L.A. Fabric District? Please add to my list of tips! This isn't a sale, it's an everyday thing! The LA Fabric District is full of good deals. SOOO cool. I live maybe a 1/2 hour away from the Fashion District so I can go when ever; however, I make sure that I sew up what I have bought before I go again - otherwise I become a shopper and not a sewer. I can totally see that happening to me. I like being a sewer...but find myself being a shopper most of the time! I just came across your post on pinterest...I SO wish I lived there to go to those two places!! We have nothing like that in Ohio! I would love to get a big stash of fabric for a great price!!! Okay so I know you wrote this post forever ago but I do have one tip to add - hit up the FIDM scholarship store too! It's about a mile from the fashion district so you'll need a separate meter but I got so much good stuff there last time. The back of the store has a room with tons of knits for $1-2/yard, metal zips for 25 cents, and lots more. Jackpot! I'll have to look for LA Alex next time I'm there.